I made this cake for my son-in laws sister. She likes Tiger Lillie's and yellow a purple. i decided to make a basket with the flowers in it for her. She really liked it and i was happy to make it for her. The cake is 2 round white cakes. They are torted and filled with white chocolate gouache. I then frosted with Italian butter creme frosting. 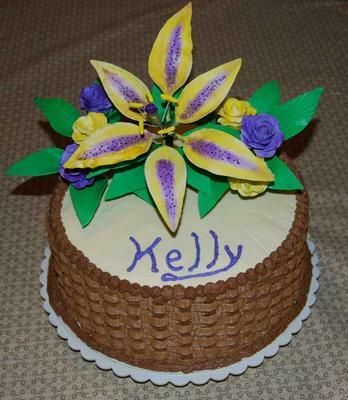 I used a basket weave tip for the side and piped the word Kelly with a number 2 tip.